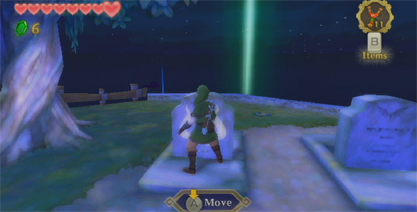 The Skyward Sword Lost Child Quest is activated after you complete the Skyview Temple. Go to Skyloft and, near the Statue of the Goddess, a woman will approach you about her missing daughter, Kukiel. 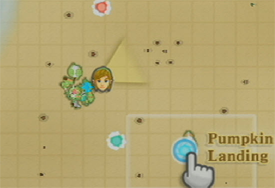 To start the Skyward Sword Lost Child Quest, during day time, talk to a brown-haired girl near the graveyard, who will tell you to head to the Lumpy Pumpkin and talk to an old man there (it’s on the Pumpkin Landing, a small floating island to the east of Skyloft). Go inside the Lumpy Pumpkin and talk to the old man sitting at the table. He’ll tell you about the Skyloft monster. Apparently the monster pushed a gravestone near a tree and opened up a hidden passage. A door will open in a wooden shack. Go inside and you will find the Skyloft monster, known as Batreaux, inside his lair. Swing your sword towards him and he will beg for mercy. Batreaux will tell you that he means no harm, but was just playing a game with the child. He was happy to meet someone who was not scared of his demonic appearance. Talk to the girl, who is Kukiel, and then go to Kukiel’s house (near the Skyloft Bazaar, beside a bridge). You can sleep there and make it day time again. Talk to Kukiel’s mother, who will reward you with 5 gratitude crystals and you have now completed the Skyward Sword Lost Child Quest!